When booking a newborn session, there are two options. The most popular is the full newborn session, but for those who are time or budget limited, you might prefer the newborn mini-session. A full newborn session consists of baby-only poses on the bean bag with 2-3 blanket colors, with several props & different background setups, as well as poses with parents and siblings. A session like this typically runs from 3-4 hours, and will deliver anywhere from 30-60 final images. A newborn mini session consists of baby-only poses on the beanbag with no more than 2 blankets, and typically only 1-2 props setups. 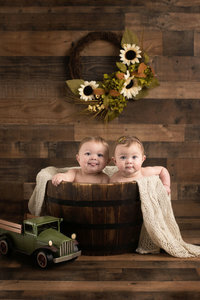 A newborn mini-session does not include parent or sibling poses. Newborn mini-sessions typically last 2-3 hours, and will deliver anywhere from 20-40 final images. Mr. Max came in for a newborn mini session last September (yes, I am THAT behind in blogging my sessions, ugh!). He was so sweet, and slept like a dream for me. We finished up his session in a new record – two hours! His Momma picked out navy blue, light blue & cream for his session, and I think it turned out beautifully. I don’t know if you have noticed, but other than the dark wood tones, I have recently been straying away from the darker blanket colors. But I was excited to pull out my navy blue & pair it with both a light cream & a charcoal grey. I ended up loving those combinations again! Mr. Max really reminded me of how my son, Lincoln, looked as a newborn. Lincoln had the same chubby cheeks, button nose, short blond hair, and bow-shaped kissy lips. So it was with a burst of nostalgia, from a decade ago, that I enjoyed while snuggling this little guy during his newborn mini session. Questions? Ready to book your Newborn Session?